Admiral supply co is a brand with a very good reputation, it was established in 2013. Admiral brings quality products to the table. Pomade comes in a 4 oz plastic amber jar with metal twist top. On top of the lid, you come across the red labeling that represents this classic hold. There, you read info on the company and the hold type. Spinning around the jar gives me the impression of professional design: clean, transparent stickers with the logo, bar code, ingredients, pomade type and the amount of product. Pomade inside looks dark due tot the amber tint but has a light brown, cola hue. This formula contains organic beeswax (no PEG-8 Beeswax) which is quite rare for a gel-type. Dig that a lot! I suppose mine is an older batch. Don’t going to explain the chemicals in there, these don’t differ much from other gel types. What struck me, is the use of glycerin, titanium oxide and mica (latter 2 are coloring agents from good quality). Coconut. To me, this is a mix of the Shiner gold and Grant’s medium blend smells, tuned down a tad. Coconut is not that exciting and manly, but this one does a good job. 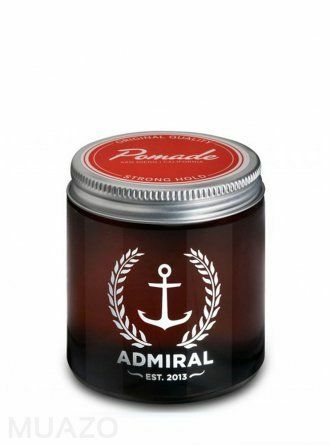 The Admiral coconut scent is subtle, balanced, not overpowering at all sniffing into the jar. In the hair: I caught whiffs, nice and pleasing ones, not tart or overbearing. I like it. Application: 3 big fingertip licks into damp hair. I prefer styling damp as it tames my wavy mop and it makes application much, much easier. Scooping out: gel-types are always peanuts to scoop. Breakdown: feels thinner, softer and less sticky than many other gel pomades. Working in: no hassle. Didn’t experience the typical sticky tug and pull. You can disperse it evenly easily. Combing back: use an air motion brush which makes it comfortable to comb through without any tension. It slicked back very nice and facile. Using some sort of other styling equipment works comfortable as well. Combing the hair side wards, making a part went well. Control: Admiral classic laid down my hairs tight quickly. This pomade is not so sticky, so much more comfortable to style with. It does not stiffen up immediately. In that regard, it works more like a good hair gel. My cowlick at one side is very nasty but Admiral tamed it quite fast. Lifting the front went without issues too: it managed my waves great. No stray hairs. Weight: light-medium feel. In my mop, many orthodox water based pomades will weigh down because of the tacky grip but the one here, does not. Gaining some proper volume and height are no problem. Styling time: rather quick. A pleasure to work with. Initial results: many gel pomades give me a blocky and flat shape but this one not. Everything looked clean and neat. Results after 30 minutes: my hair had not sag, no splits or hairs popping up. Orthodox pomades tend to sag and cause loose hairs once the water evaporates but Admiral classic did not. Admiral did not harden into a helmet, in my hair it felt a little hard. Medium shine but faded to a neutral after the water evaporated. Described as a strong (firm) hold. For me, it starts off as a strong but becomes more of a medium after a few hours; but a medium keeping an overall pretty clean shape. My mane sagged a tiny tad. A few loose hairs. The circumstances I tested it in were hot summer weather with temperatures around 80°F, no heavy-duty, some wind, no humidity. Recommend applying water to restyle: styles easier and boosts shine and hold level to its initial state. Products doesn’t flake. I did the test with dry hair and it worked well. My hair looked nice and no loss of hold, no flakes. Water-soluble: just water and all is gone. No ‘straw hair’ afterwards. Admiral classic hold has a great reputation and I can only second this! This is a quality pomade: in its application, smell, hold and endurance it’s well-refined and balanced. The Admiral classic hold is one of the best gel pomades I tried! Prospectors, Gold rush: medium-light gel pomade. The Daimon barber N°1, now ‘Original pomade’: medium-light gel pomade.